Choosing a destination wedding dress can be stressful at the best of times. The usual worries seem to fade away as you realise that you need a dress that will fit not only style of your wedding, but the location, climate and most importantly, you! You try on four, maybe five, and none of them seem to fit exactly right. You haven’t had “the moment” seen on every rom-com movie and reality TV show and your special day is creeping closer and closer. Not to worry! We have curated a top 10 list of destination wedding dresses for inspiration to suit you no matter your style, location or climate. So if you’re planning a wedding on the beach, amongst snowy mountains or next to a gigantic waterfall (here’s looking at you, Iceland) here a few of the wedding dresses we love for 2018. Check out our top 10 designer dresses for more dress inspo! All of the dresses from White Meadow Bridal are utterly romantic, flowy and feminine. This lacy number is our personal fave but be sure to check out the range on their website that is any boho brides dream. Style and comfort are two very important aspects of any wedding attire. The ‘Eloise’ dress from Allure Bridals is just that, offering a relaxed fit with gorgeous delicate details perfect for any beach wedding. Floral dresses add a little something extra special and look amazing in any lush rainforest or mountainous location. We can’t go past the gorgeous embroidery on this one from Odylyne the Ceremony. Opting for a Kate Middleton-esque dress? Grace Loves Lace has a range of beautiful and classic floral gowns that would suit a church wedding (or any wedding!) perfectly. There are a lot of things to think about on the day when getting married in the snow, and your dress doesn’t have to be one of them. BHLDN specialises in vintage wedding gowns that will be sure to keep you warm even amongst the snowy mountains! Karen Willis Holmes has gowns that are the perfect for colder weddings, but not quite snowy yet. It can be hard to find a style that works as a middle ground between keeping you warm and looking appropriate for the location, but these dresses do just that. Jumpsuits serve as one of the simplest ways to add a modern twist to any bridal outfit, as well as the comfort and ability to dance the night away more freely. You’ll be spoilt for choice with One Day Bridal with their range of breathtaking jumpsuits and gowns to suit any modern bride. Another one form Odylyne the Ceremony. Minimalist, chic and perfect for any location. AND it comes in blush pink. We’re sold. 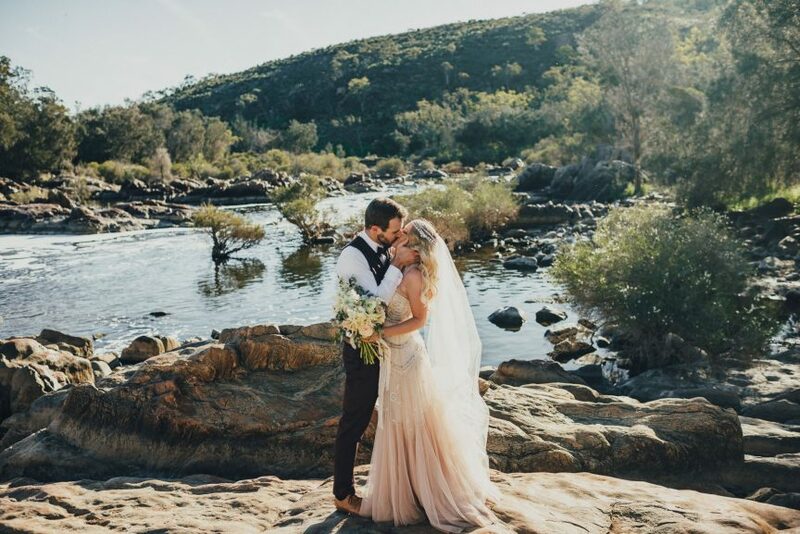 This outback elopement was styled perfectly with a simple Brides of Sydney dress. With such a breathtaking backdrop less is definitely more in this department. A simple pair of boots ties the whole look together whilst also being the most practical option for outback Australia. Happy Valentines Day! @whitemagazine is our favourite magazine and they made our day today by publishing the stunning work of @amanda_peppermintphotography featuring @hideandrose! Check out the chemistry between Kelly + Jac, that's LOVE! They rocked it! Link in bio. Never underestimate the power of a trendy jacket for any bridal ensemble. Whilst it may sound a bit out-of-the-ordinary at first, there are a range of different styles to choose form to suit any kind of dress, wedding and climate. Hide and Rose is our first pick for leather jackets if you are looking to add an personalised edge to your bridal wear.